Voorheesville Village Hall is located at 29 Voorheesville Avenue, Voorheesville NY 12186; phone: 518-765-2692.The village was incorporated in 1899, the village is named for Alonzo Voorhees. 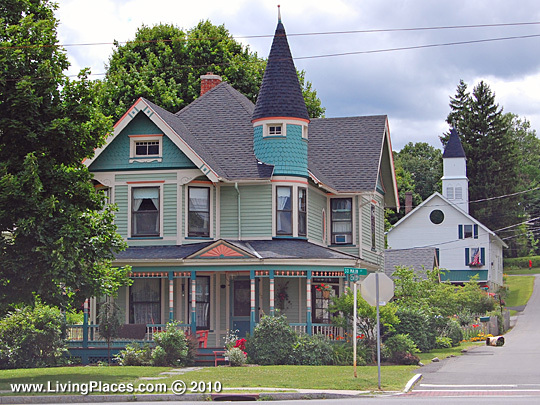 The village of Voorheesville is situated centrally east and west near the northern boundary of the Town of New Scotland at a junction of what, in 1897, were the Albany and Susquehanna and the West Shore railroads. It's business importance was chiefly attained since the opening of these roads. The village takes its name from Alonzo B. Voorhees who built one of the first dwellings before the completion of the Albany and Susquehanna Railroad. It was a pretentious residence, subsequently owned by S. V. R. Hoes, and afterward, by Charlotta Coughtry. Peter Wormer built and kept the first store, and William Spore erected a fine residence. The post office was opened in 1868 with James, A. Reid, postmaster. After completion of the second railroad, making the junction at this point, Conrad Fryer built and opened a large hotel; Morris Harris opened a public house. Mercantile interests were represented by Joslin Brothers, hardware, J. B. Wands & Sons, Cummings Brothers, Levi Wood & Co., L. S. Schell, Thomas Brewster, Crannel Brothers, and Frank Bloomingdale, a dealer in hay and grain.